Hello everyone and it's another warm welcome to our latest newsletter bringing you all the goings on from Cheshire's friendliest Golf Club! It was the final round of the Winter League group stages on Sunday and there was a battle to secure a spot in the top four to advance to the matchplay semi-finals. In the end it was Captain Paul Underwood and his son Kieran Underwood that made a decisive move by scoring 23 points, the 2015 Summer pairs champions fired an eagle and two birdies including a crucial one on the last hole when Kieran holed a long putt to improve their overall points total by 3 which was enough to move them into the final top four positions. It was tough luck for Tim Barnes and Chris Whalley who went into the last round in fourth place and despite a 22 point haul it wasn't good enough to keep them in a qualifying position, the winners on the day were Julie Daines and James Eaton who have had a storming finish to the Winter League, they scored 24 points including three birdies. The matches have to played by Sunday 5th March, good luck to all 4 pairs! Current Captain Paul Underwood has been keen to bring the different sections of the club closer together and on Saturday played the new Inter-Section competition. The format was fourballs containing one player from each section of the club from the men, ladies, seniors and juniors - the target for each player was to win in their fourball to gain as many points for their team as possible with 5 points for 1st, 3 for second, and 2 and 1 for 3rd and 4th respectively. Captain Paul led from the front with the highest points score of the day on 21 Stableford points as the Men took the early lead with Ladies Captain Audrey Kettle finishing 3rd in the first match. The Men then moved further ahead when Dave Shering saw off Junior Captain Kieran Underwood. The juniors then started to close the gap with Javier Lang and Joel Cann who have been impressing in the Junior Winter League winning their matches. Steady performances from Stuart Gray and Ian Daines meant that the tight contest was won by the Men's Section with the juniors close behind. The Ladies finished in third just ahead of Bob Bowen's seniors meaning that Kieran will have to present the Trophy to his Dad at the AGM. Feedback from those that played was that everyone enjoyed playing for the new Trophy and we're sure it will become an annual event, thanks to Paul for setting it all up. It is great to see that the junior section is thriving and hopefully in the next 18 months we will be able to enter one of the local junior leagues. The February Midweek Stableford took place last Wednesday and it was 20 handicapper Alan Taylor that hung on to take the victory with a 42 point winning score, this was just good enough to see off Paul Foster who came in with 41 points, funnily enough both of them failed to score a point on the 16th hole! In third place was Chris Whalley on 40 points, he didn't mind the 16th hole as he had a nice birdie two on there! The next competition takes place this Saturday at 11am as we play the February Stableford. We've got a great new product in the store called Grip Pro, it's basically a cleaning solution specially formulated for golf grips that makes an old grimy grip feel tacky and new again with just a few sprays and having tried it we know it works. The guys at Grip Pro have designed a great video showcasing the product and why it's so good and they filmed a majority of the video here at Hartford Golf Club, check it out here. At this time of year it's exciting to see the arrival of lots of new clothing and shoe ranges - the latest to arrive is the new eye-catching FootJoy collection. 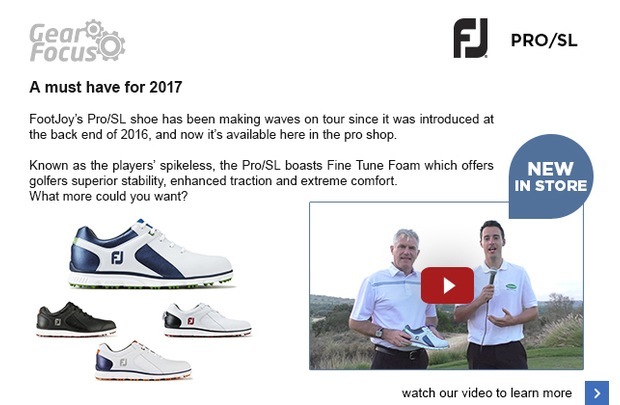 The new clothing looks pretty good but the standout item is the new FJ Pro SL spikeless golf shoe that has been worn a lot on tour by players such as Adam Scott. As soon as they arrived we had to try them on and we can report that they are very comfortable and lightweight but also sturdy through a perimeter weighted outsole and the Pittards leather construction is extremely soft as well as being 100% waterproof - as you can see from the photos the Pro SL also look pretty smart! Even though they have just been launched FootJoy have already experienced massive consumer demand for these NEW Pro SL shoes and as such they are quite hard to find, we are lucky enough to have them in stock before a lot of internet sites so if you're looking for a pair please call in and try some on, you won't be disappointed! Don't forget that we have a great offer on at the moment - we will regrip your 7 iron for you with a new Golf Pride grip for FREE! 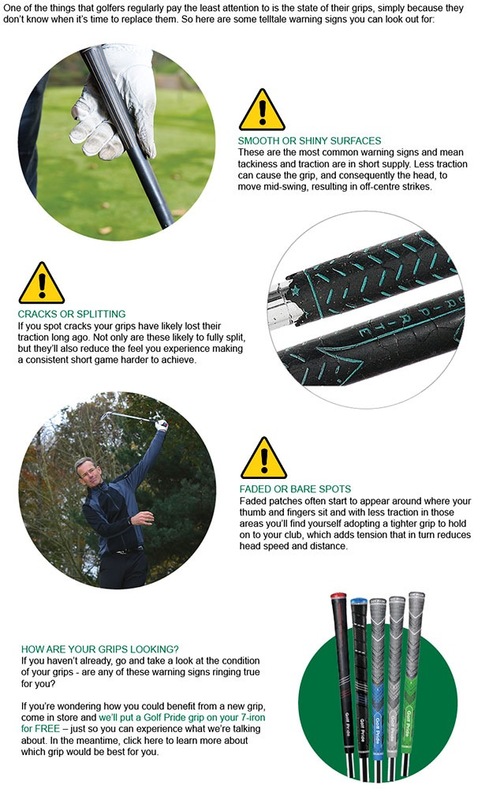 There are no catches - you don't have to get other clubs regripped too, we just know that many of you will not have changed your grips for years (if ever!) 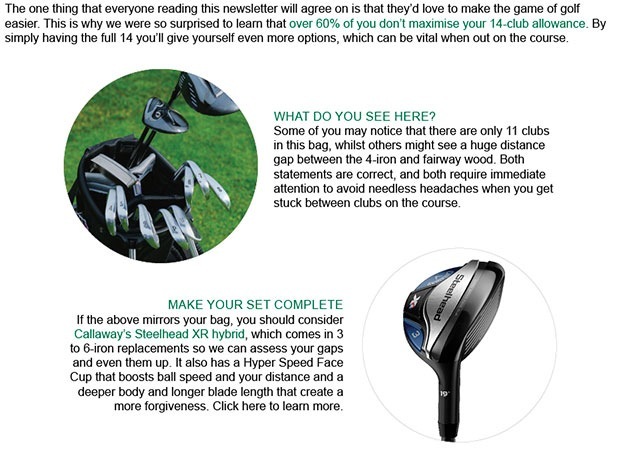 and we want you to see how good a new grip feels! As we have a limited number of free grips the offer will have to end soon, we reckon we have about 5 free grips left so that's only another 5 of you that can take advantage of this great offer, so our advice is to claim your new grip as soon as possible before they all go!